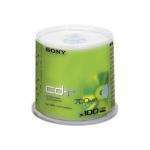 Just went to my Local Sainsburys in Bridgend, South Wales and picked up this 100 pack on Sony CD-R's for only £9.99. Thought it was a good price being sony and.... alot cheap on play.com as they are selling them at £22.99. However, they dont appear to be online. Not sure how long they are on for as they were in the half price section by all the other media. This is a great deal if you can find it. I have never had one disc fail on me. BUT my nearest Sainsburys NEVER reduces them. Glad i'm not the only one. My pinch of salt pile is starting to generate public interest. This is a great deal if you can find it. I have never had one disc fail … This is a great deal if you can find it. I have never had one disc fail on me.BUT my nearest Sainsburys NEVER reduces them. Well whoopi doo! I went in this afternoon and there were 4 in stock. They must have "found" some more since last week. I bought 2 spindles which should last me forever! Anyway thanks OP - it got me to check them out again. One thing about Sainsbury's, if you are looking at the offer shelf for stuff and the item you want is listed but no stock, don't give up, have a look around the corner where the other stuff/blank discs are stored and you will often find the same stuff stacked there at higher prices, if you compare the bar code to that on the offer shelf it will almost certainly be the same and at the checkout you will be charged the offer price. I found this with the Verbatim DVD's, none with the offers but plenty (without the offer price on the shelf) on the next isle, it's not a con as you get the offer price at the checkout anyway.